You are currently browsing the category archive for the ‘Medical Homes’ category. If only primary care providers played on a team rather than running alone, they may be able to address the inefficiencies of the status quo. 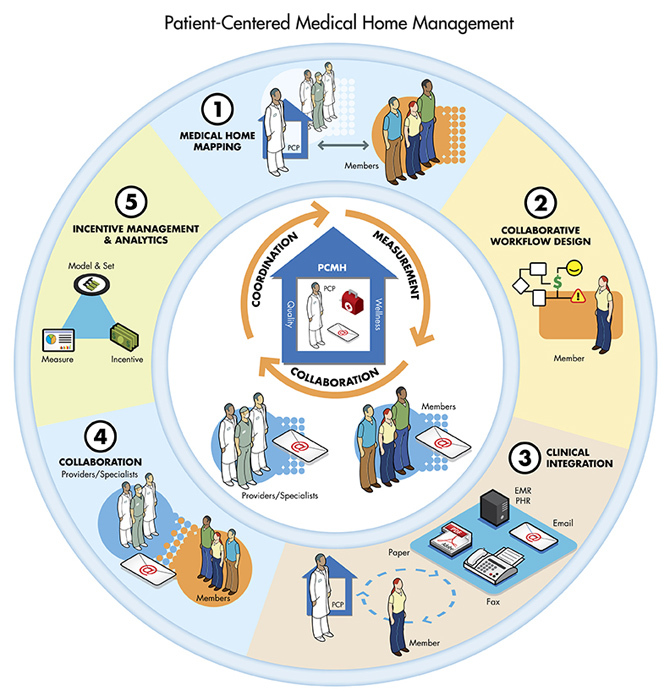 The patient-centered medical home (PCMH) model may not be a silver bullet—but is growing in popularity and can offer the support needed by many physicians. The NCQA joint principles, on which many states base their pilot program definitions, require a team of physicians to collectively take responsibility for the ongoing care of patients. With a whole person orientation of coordinated care, the PCMH promotes efficient and effective long-term delivery of care. Also encouraged under these guidelines is the adoption of Health Information Technology (HIT) in order to enhance access to care and improve quality and safety. Proper utilization of HIT provides support tools to guide decision-making and prevent wasting time by no longer having to sift through paper files. According to a 2009 Kaiser Commission on Medicaid and the Uninsured report, Community Care of North Carolina, the state’s Medicaid program and a pioneer in establishing patient-centered medical homes, had an estimated savings for FY2006 of over $150 million. An evaluation found the state achieved $3.3 million in savings for people with asthma and $2.1 million in savings for people with diabetes between 2000 and 2002. In Seattle, Washington is the nonprofit, consumer-governed, integrated health insurance and care delivery system, Group Health Cooperative, which was recently examined in Health Affairs. Investments in the medical home model led to an improvement in patients’ experiences with care, quality of care, and providers’ work environment–all while saving money. Adopting new standards in order to transition to a medical home overnight is not a possibility for any practice. Another Health Affairs article (“How Physician Practices Could Share Personnel and Resources to Support Medical Homes”) provides suggestions how physicians, particularly in small practices, can utilize resources to make the change as easy as possible, citing existing examples. After only 26 months, a study of the Patient-Centered Medical Home National Demonstration Project shows it can take years to see improved patient-outcomes. However, improvements in access and better prevention and chronic care scores were already experienced under the demo. A supplement to the May/June issue of the Annals of Family Medicine, also focused on implementing medical homes, provides lessons learned. CMS is accepting applications for the Multi-Payer Advanced Primary Care Practice Demonstration, bringing Medicare, Medicaid and private payers into up to six state-operated PCMH demos. With the pilots included in the federal health reform bill and established separately through state legislation, opportunities to create medical homes will only continue to increase and the time to become informed is now. The final segment in this three-part posting will feature state approaches to addressing payment and billing issues. Please feel free to leave comments, rate posts, or suggest topics.